Campaigners claim the current plans for the tunnel would breach one of the restricted covenants in the deeds from 1915 that were made part of the condition of the gift to the nation three years later. They said the document prevented building work within 400 yards (365m) of a milestone just north of the monument, and plans show the tunnel within about 375 yards (343m). He said the deed was mentioned during a previous planning procedure for a tunnel in 2004 and it "added no material weight to the discussion". Andy Rhind-Tutt, the chairman of Amesbury Museum and Heritage Trust, raised the subject during the meeting and asked how they intended to deal with the "restricted covenants". "My question is, have those deeds been presented to the panel and if not, why not," he asked. 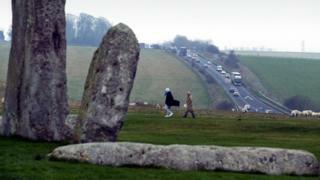 Several other groups, including the Stonehenge Alliance which opposes the tunnel, backed the view of the museum trust. Highways England was asked at the inquiry to provide a "comprehensive reply" to the Planning Inspectorate about the deeds. The government wants to build the tunnel to hide the busy A303, but opponents claim it could destroy archaeological treasures and scar the landscape. The tunnel is part of a £1.6bn programme to upgrade the A303, which links the M3 from London to the M5 in the south west. A public consultation into the scheme ended in April 2018. Work on the project is due to begin in 2021.